A 2.5-year-old female presented with generalized edema, epistaxis, and blood in stools for three to four months. Physical examination revealed pallor, petechiae, anasarca, and moderate hepatosplenomegaly. Hematology work-up showed macrocytic anemia (hemoglobin-3.5 gm/dl, RBC count-3.3 × 10 6 /μl, MCV-102.9fl, MCH-30.9 pg, and MCHC-30 gm/dl) with leukocytosis (TLC-92 × 10 3 /μl), and thrombocytopenia (platelet count-9 × 10 3 /μl). 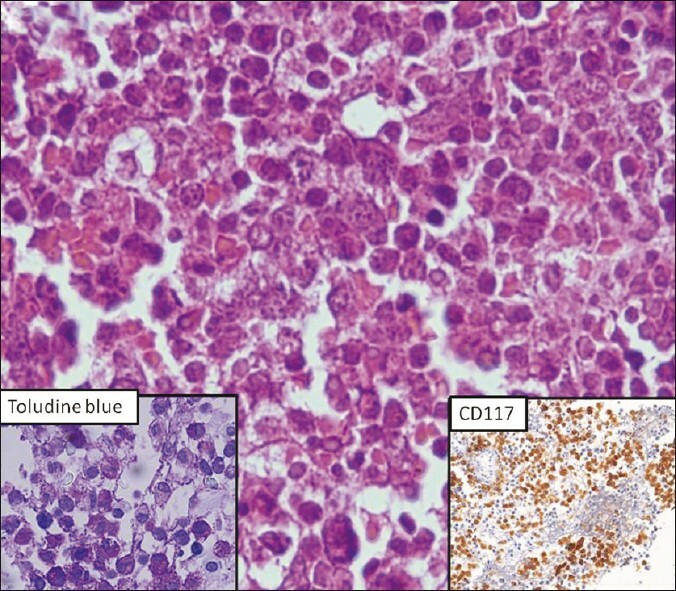 Peripheral blood smear showed leucoerythroblastic blood picture with 4% blasts and occasional mast cells with atypical morphology [Figure 1]. 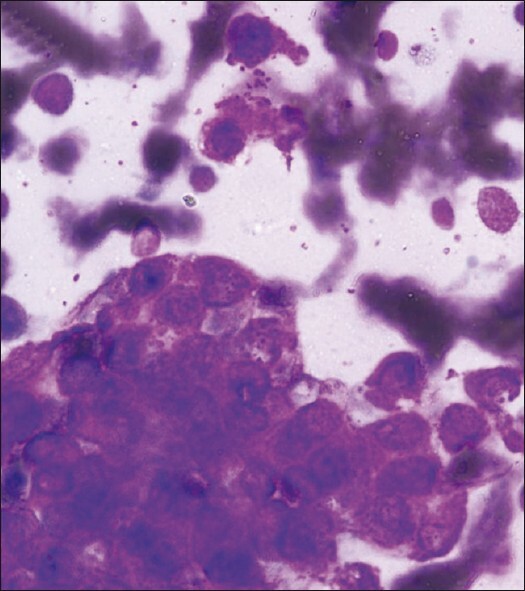 Bone marrow aspiration (BMA) revealed cellular marrow with 11% blasts and features of dysmyelopoiesis and dyserythropoiesis. There were numerous mast cells lying singly and in variably sized clusters of >15 cells. 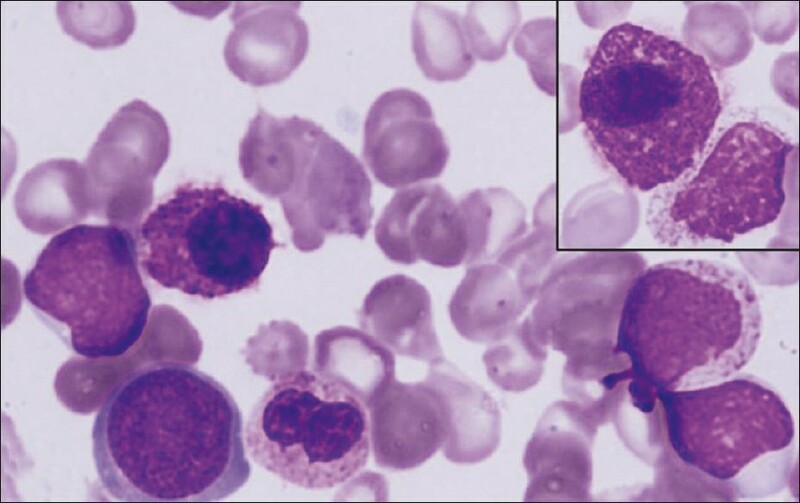 Few of these mast cells showed atypical morphological features in the form of fusiform shape, hypogranularity, eccentricaly placed nuclei, and uneven distribution of granules [Figure 2]. There was suppression of megakaryocytic series with presence of occasional micromegakaryocytes. On toluidine blue staining, this mast cell stained positive for metachromatic granules. Bone marrow biopsy showed clusters of similar mast cells, positive for CD117 [Figure 3]. Few cells were positive for CD34. Thus, based on above morphological and immunological features a final diagnosis of systemic mastocytosis with myelodysplastic syndrome-refractory anemia with excess blast-II (MDS RAEB-II) as an associated clonal hematological non mast cell disease was given. Patient stayed in the hospital for two months and treated symptomatically. However, spleen and liver increased in size and peripheral smear blast count became 10%. She was referred to higher centre for therapy, but succumbed to her illness. To summarize, SM-AHNMD is primarily a morphological diagnosis based on thorough examination of BMA and trephine biopsy specimens. We thank Dr. Richa Chauhan for helping in drafting the manuscript and photograph. 1. Horny HP, Parwaresch MR, Lennert K. Bone marrow findings in systemic mastocytosis. Hum Pathol 1985;16:808-14. 2. Horny HP, Kaiserling E, Campbell M, Parwaresch MR, Lennert K. Liver findings in generalised mastocytosis. A clinicopathologic study. Cancer 1989;63:532-8. 3. Valent P, Horny HP, Li CY, Jaffe ES, Harris NL, Stein H, et al. Mastocytosis. In,Tumours of haematopoieticand lymphoid tissues (WHO). Lyon, France: IARC Press; 2001. p. 291-302. 4. Hasle H. Myelodysplastic syndrome. In: Pui CH, editor. Chilhood leukemia. 2 nd ed. New York: Cambridge University Press; 2006. p. 551. 5. Valent P, Akin C, Sperr WR, Horny HP, Arock M, Lechner K, et al. Diagnosis and treatment of systemic mastocytosis: State of the art. Br J Haematol 2003;122:695-717.